Luxury taxi company Uber has stepped up its efforts to win over consumers by tapping into people's need for ice cream in the hot weather. "No matter where you are in the world, there's little that captures the sweetness of a sunny afternoon better that ice cream," Uber wrote in a message to its consumers. 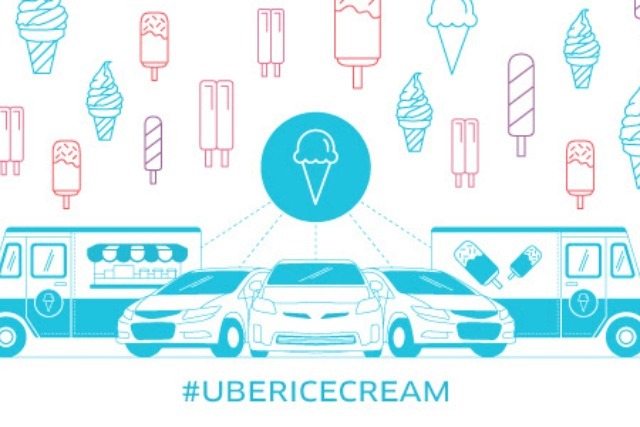 Referencing today (18 July) as the hottest day of the year, Uber is serving up ice cream "on demand" in 144 cities in which is operates across 38 countries. Ice cream vans will be available in Central London between 11am and 7pm on behalf of Uber, with consumers able to buy five Mr Whippy ice creams for £20. Consumers can find the ice cream vans through their Uber app while paying for them at the the same time. The move comes as part of Uber's continuous efforts to trump its rivals and stamp out competition from black cab drivers. It follows a press ad that Uber ran claiming that it was "keeping London moving" on the day the London cab drivers went on strike in protest against the taxi service.